The very first review I ever wrote for Amazon.com was for this book’s predecessor: The Star Wars Action Figure Archive. I liked the original quite a bit, so I immediately pre-ordered this book when I first saw it. I have spent the last couple of days carefully reading some parts and an quickly thumbing through others (for now) so I could write this review and let folks know what to expect. All things considered, I think this book is as good as the the original in most ways and believe it easily deserves at least 4.5 stars (rounded up to 5 stars since fractions were not an option). Here’s why. First, this is a reference book and not a price guide (so, it contains tons of timeless information, but no prices that are quickly outdated). Second, it shows a picture of every figure released as off the time the book was set to the publisher, including most variations and many more obscure figures (with nearly 340 pages containing 6 or more photos each, I have no doubt the author covers at lest the 2300 figures mentioned in the intro). On a related note, all of the pictures are nicely sized so you can easily see the detail for each figure. For example, there are 54 Darth Vader figures covered over eight pages, and 89 Luke Skywalker figures covered over 11 pages. Second (at least for the vintage figures and probably for the rest, too, though I can’t say for sure because I don’t collect those), it shows each figure holding/wearing all of the weapons/accessories it originally came with. Third, it shows at least one still photo for a vast majority of the figures from the movies, TV shows, and/or comics (this is a wonderful way to see how the figures compare to the character they represent). Fourth, there is a brief commentary on every figure, and a slightly more in depth commentary on more important figures. Fifth, everything is in full color and on high quality semi-gloss paper (the book is an inch thick and weighs over 3.5 pounds). Finally, on p. 10 it shows a sample photo of the card/packaging from each of the 29 production lines included in the book (I mention this as it was one of my favorite features of the book). That said, this book is a reference guide for the figures themselves and therefore does not deal with packaging of each figure in any meaningful way (so, if that is what you are looking for this may not be the book for you). This is too bad as it was a great feature in the original book (and my primary reason for giving it 4.5 rather than 5 stars). But, it does what it set out to do exceptionally well, is very fun to go through, and contains a lot of useful information that is not readily available elsewhere (especially all in one place), and I’m happy to round up to 5 stars. So, I think most Star Wars action figure collectors will find it to be a worthwhile reference for their library. This book is everything a long-time fan, like myself, wants from a reference book about the Star Wars toy line. This covers the entire line, up to the present, with excellent photos showing figures with their accessories. Even though I am a reformed collector, this will have a space on my bookshelf for years to come. 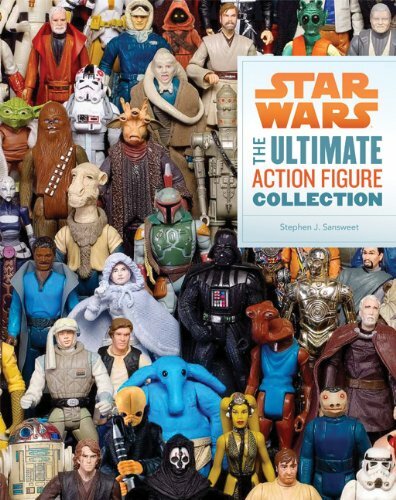 Tony the Toyman provides a great summary of the positive aspects in his review, “Does what it set out to do extremely well.” However, as a serious collector and fan of Sansweet’s previous reference book, The Star Wars Action Figure Archive, I was disappointed. For starters, almost every figure is represented but many entries don’t show all the accessories that came with the figure – this is painfully apparent in the “clones” section. You get one picture of each figure, no multiple angles and some of the special features aren’t properly called out. Also, some figures that came packed together are never pictured on the same page making it difficult to grasp which figures came in a set – have I mentioned the “clones” section yet?. The introduction section shows an example of the packaging for each figure series covered, but following sections never show the packaging for individual entries let alone the packaging of sets. None of the vehicles, playsets, or other toys that are part of the Star Wars action figure line are shown or properly discussed to help give context to certain figures – see “Snaggletooth (blue)” for example, it would have been nice to show a picture of the Cantina Playset the infamous figure came in. Also, some figures come with accessories that work with vehicles and playsets but that is never discussed because a lot of accessories aren’t shown and vehicles and playsets are absent. I also don’t understand the book’s logic for what qualifies as a figure for inclusion. Imperial Probe Droid from the 1980’s Hoth playset qualifies but not the Dianoga trash compactor monster that came with the Death Star playset, let alone a Rancor or a Wampa. Despite my negative review I recommend this book because it is a great reference guide and fun to browse, but it lacks the level of detail necessary to be truly helpful to the collector community. Just received this clock in the mail. It looks great and I love the fact that it doesn’t have any of the characters from the newest films. However the clock I received is slightly different than the picture. It has black hands instead of white hands. That makes it hard to see what time it is from across the room. Good size clock for the price, material is light and easy to hang. The only problem I came across is it can be hard to read the black hands on the dark background unless you have light reflecting off the gloss at you. Simple model paint or the girl friend’s nail polish fixes this problem. I bought this wall clock to go along with my son’s star wars themed room. When I first got the clock it was working fine and then few weeks later, It just stopped working, I replaced many batteries thinking at first the battery must have been bad but after replacing it with new batteries, it did not work any more. By the time this clock stopped working, the return policy on this ended. I’m stuck with a broken wall clock now. Save your money and don’t bother buying this cheap wall clock that will only last a very short time.